I Have 3 PWA 2520 tools. It is a T handle driver with a 90 degree bend at the end which is slotted. Any ideas what its use was? While cataloging wrenches for the Fall Wrenching News Auction I found this Bonney PWA tool. 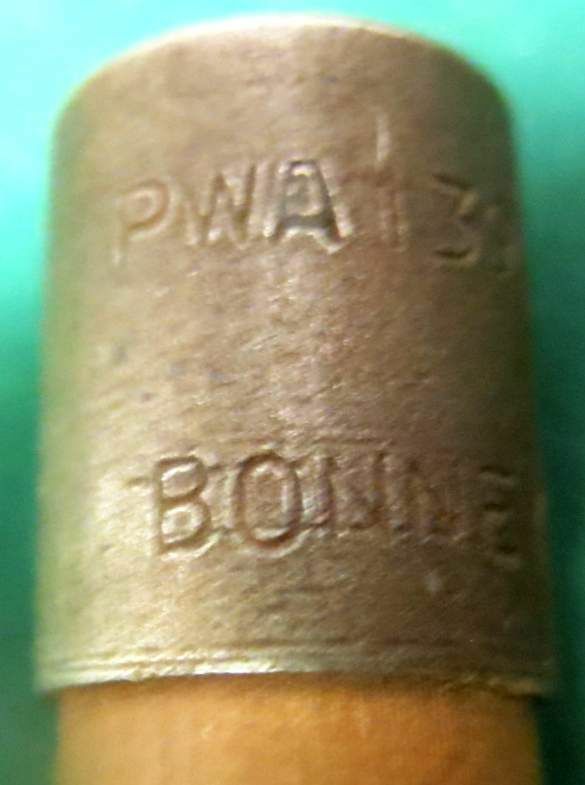 At first I thought it was a cartridge fuse but saw it was marked BONNEY PWA 1395 which is listed in Rusty's list as "PWA-1395 Drift, Fiber, Piston Pin, R-all,[Bonney]". It's 6.5" inches long and the body is made of what seems to be some kind of phenolic with a metal cap. Doesn't look like it was ever used. I came across a PWA 5028 extension. It is a half inch female, that transitions to 3/8" male drive. Marked only PWA 5028. I think it is Plomb. And WWII since it appears to be bare metal, or possibly cad plated. In great shape, and no rust. Would like to trade for Plomb tools, specifically 9/32" stuff that may or may not be WF series. But would consider other Plomb ratchets or extensions or sockets. It does not appear on your list. Do you think it is of Plomb manufacture? I do have some PWA sockets, just have to find them. Went to the habitat restore today and picked up a BONNEY PWA-1239 double box end wrench in 1/2 x 9/16. No rust due to grease and oil residue. Sorry, no pictures. Here is a Bonney PWA1113. A couple more. I don’t think that the PWA 1058 offset screwdriver is on the list. Shouldn’t these be in the Aircraft tool section? A friend sent me some pictures of his recently acquired PWA 1055 marked 4” Crescent Crestoloy adjustable wrench. That is a keeper, Don ! That bottom wrench may have fit on the prop shaft splines and used for rotating the engine while setting magneto timing or valve clearance.